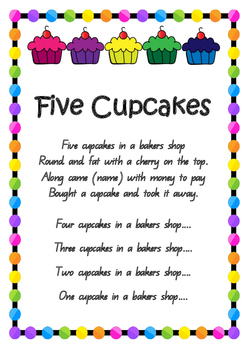 Print out the Five Cupcakes number song poster and 5 cupcakes pictures. Cut out the cupcakes individually and laminate for durability. 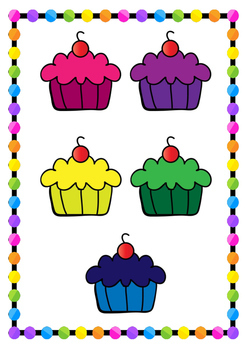 Magnetic tape or Velcro dots can be attached to the back of each laminated cupcake and placed on a magnetic or felt board. 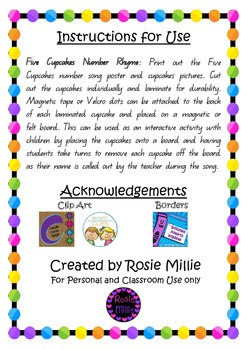 This can be used as an interactive activity with children by placing the cupcakes onto a board and having students take turns to remove each cupcake off the board as their name is called out by the teacher during the song. 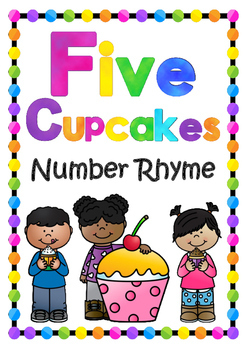 Number Rhymes, Nursery Rhymes, Counting Rhymes, Number Songs, Counting Songs, Five Cupcakes, Five Cakes in a Bakers Shop, Songs and Rhymes, Magnetic Songs, Cupcakes, Song Poster, Song Chart, Posters and Charts, Kindergarten Songs.